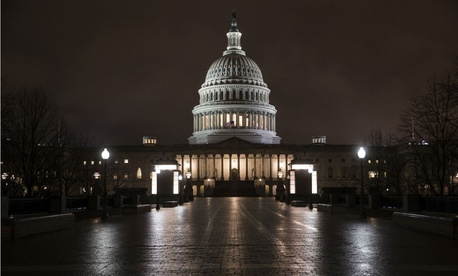 Lawmakers on Wednesday finally unveiled a $1.3 trillion funding package to set spending levels at every federal office across government, allowing themselves less than three days to approve the measure before the government shuts down at midnight Friday. The measure has been delayed several times as lawmakers negotiated over an array of sticking points, with leaders initially estimating they would release the bill last week and then earlier this week. The bill allocates $63 billion more for domestic agencies than they would have received under previous spending caps thanks to a two-year budget deal President Trump signed into law earlier in the year. Agencies are currently operating under their fifth continuing resolution of fiscal 2018, which is set to expire Friday night. Lawmakers will now rush to pass the 2,232-page agreement, with the House expected to approve it Thursday or Friday before sending it to the Senate. The upper chamber’s expedited schedule will require a sign off from every senator, raising the possibility that they will have to work into the weekend to wrap up the agreement. Conservative House members also criticized leadership for negotiating the deal in secret and forcing a vote without enough time for members to read the bill, saying Congress should instead approve another short-term stopgap to slow down the process. Leadership in both parties expressed approval for the measure, boosting its odds of passage. Rep. Rodney Frelinghuysen, R-N.J., the appropriations chairman, praised investments in defense, border security, efforts to combat the opioid crisis and infrastructure. In addition to setting funding levels, several high-profile provisions of the bill will implement key new policies on agency operations. The Homeland Security Department, for example, would be able to hire just 65 new customs enforcement agents. Trump had requested Immigration and Customs Enforcement hire 1,000 new agents in fiscal 2018 as part of his mandate that the agency hire 10,000 additional law enforcement personnel. The measure does include $1.6 billion for physical barrier construction along the U.S.-Mexico border, but prohibits a concrete wall in favor of secondary fencing and 33 miles of new barriers. Some agencies, such as the State Department and Equal Employment Opportunity Commission, will face restrictions in implementing their planned reorganizations, including efforts to cut staffers. Other provisions that held up negotiations included a shoring up of the federal background check system for firearm purchases, a tunnel project between New York and New Jersey and easing the process for the Veterans Affairs Department to close facilities and pay for veterans to access private care, among other issues. The gun issue was included in the bill and Gateway tunnel project may receive future federal funding through compromise language, but the VA reforms were excluded after Democrats objected. Due to the overall uptick in spending, most agencies would wind up with increases compared to their fiscal 2017 funding levels under the omnibus measure. Even the Environmental Protection Agency, which has faced nearly a decade of cuts, would see $763 million more than the 2017 enacted level. The departments of Defense, Veterans Affairs and Homeland Security would see the largest funding increases. Military personnel will receive a 2.4 percent pay raise, while members of Congress will once again see their pay frozen. Civilian federal employees have already received a 1.9 percent pay increase for 2018. Congressional leadership expressed optimism Congress could wrap up its work without having to hold votes over the weekend, but the exact timing of final approval remained unclear.